All festivities have their own particular challenges, I'm sure. However, as I was hanging out of the second story window of my house the other day, in the bitter cold, trying to reach the top of a twelve foot cedar tree, with my three-pronged cultivator, I decided that celebrating Christmas, in North America anyway, had more than its share of challenges. Let me explain. Every year we put lights outside to decorate the house for Christmas. It's more about keeping up with the neighbours, or at least the more colourful and theatrical of neighbours, than it is about faith. It's also about cheering up those long cold winter nights with a bit of sparkle. Pagan rituals duly assimilated. 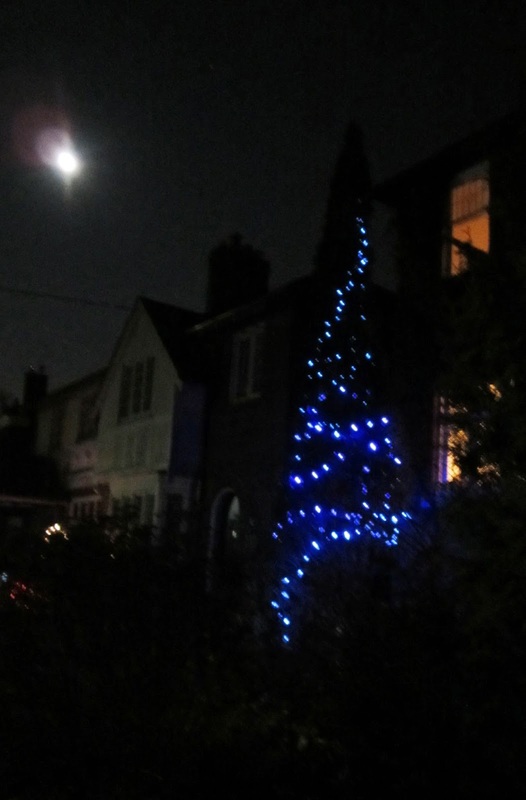 In other years, we used to decorate a small cedar tree on the front lawn with blue lights - OK, we are the more subdued neighbours. However, trees grow and what was once a child sized evergreen, is now a fully grown adult conifer, with attitude :) Yes, we could just wimp out and decorate the bottom part of the tree. But no, to do it right, we really have to start at the top. 1. a. The Plan - Throw one end of a string of lights into the top of an Emerald Cedar that was almost close enough to reach from an upper window. 1. b. The Problem - first, it took three of us just to open the window, after we had moved all the bedroom furniture to one side of the room. Fortunately, no one slipped a disc, pulled a muscle or sprained a something, however, we did bend a screwdriver or two!! 2. Adjustments to the plan - Just throwing the lights at the tree didn't work and I didn't happen to have a spare grappling hook in my back pocket. Sigh! What I needed was either longer legs or longer arms. Enter the three-pronged cultivator a.k.a. arm extender. 3. The re-purposed garden tool worked!!. The lights were anchored very close to the top of the tree. Now, all my husband (who was safely on the ground) had to do was wind the strand around the tree. Well, this bit of logic, needed some more thought as well. 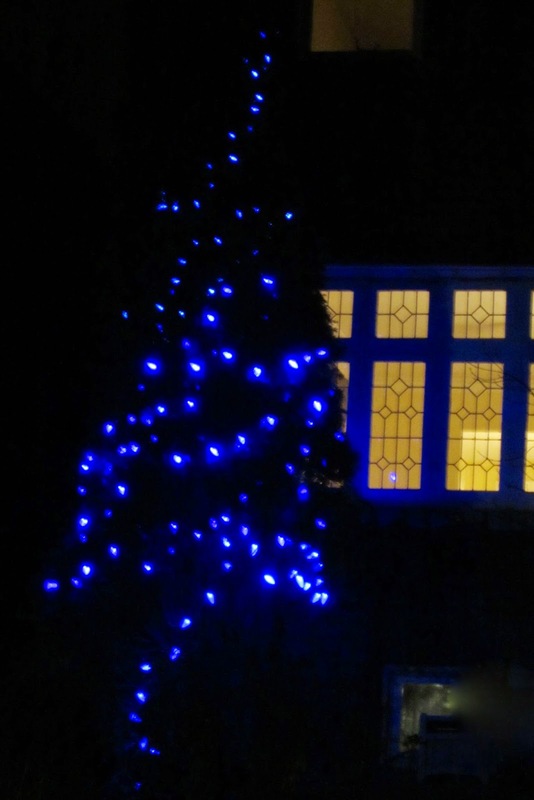 In fact, I had to use the cultivator more than once to lift the lights higher in the tree, at regular intervals, in order to get a decent spiral. This meant more precarious leaning out of the window. Maybe I was really losing my mind!! Finally, in a scene worthy of Romeo and Juliet, I leaned out of the window and said to my husband, two stories below, "You don't need me anymore." He looked up and answered, "So, is this the end?" Oh the visual. In my imagination. Thanks for a chuckle.